Below you can view all the homes for sale in the New England Heights subdivision located in Aurora Colorado. Listings in New England Heights are updated daily from data we receive from the Denver multiple listing service. To learn more about any of these homes or to receive custom notifications when a new property is listed for sale in New England Heights, give us a call at 720-729-2338. This trendy neighborhood is close to Northfield shopping center, schools, Anschutz Campus, University Hospital, and the state of the art Moorhead Rec Center. MLS#4140424. Uptown Realty Group LLC. Super close to UC Health and Children's Hospital not to mention the awesome shops at Stapleton and quick access to I-70 and 225. MLS#5682089. Wilson Group Real Estate. This home is located next to Stapleton and close to major highways for quick access to front range. MLS#9998889. LEVEL ONE REALTY GROUP. Very easy access to I-225, I-70 and retail and restaurants, as well as light rail. 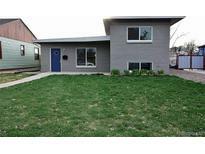 MLS#7880870. Coldwell Banker Residential 26. Great location, close to many amenities, UC Health, and walking distance to the Stanley Marketplace! This house will not disappoint! MLS#1625237. Brokers Guild Classic. Plus potential for Buyer to SAVE Thousands with this purchase, ask us how! MLS#4474479. Keller Williams Realty Urban Elite.